Most of the advances in pulsar astronomy were due to the discovery of new objects. A major increase in search sensitivity has already started a new era of discovery at the Arecibo Observatory. This increase in search sensitivity is due first and foremost by the ALFA receiver and the pulsar surveys it makes possible, which are now being carried by the Pulsar Consortium. Preliminary estimates (see below) indicate that the Arecibo Galactic plane survey using ALFA could find many hundreds of new pulsars. As of October 2018, we have already discovered a total of 185 new pulsars. Figure 1: Sky map in Galactic coordinates showing (in green) the portions of the Galactic plane being targeted by the PALFA survey. This region corresponds to most of the Galactic plane visible with the Arecibo telescope. The dots correspond to known pulsars, their color indicates their inferred distance. From the superior spectral and time resolution of the survey, it was expected at the start that it should be able to find pulsars deep in the Galaxy that were undetectable to previous surveys because of dispersive smearing. This expectation is now being comfirmed, with the discovery of many distant millisecond pulsars (the number of discoveries with spin periods smaller than 20 ms is 25 as of October 2018). A fine example of such systems is PSR J1903+0327, the first eccentric binary millisecond pulsar in the Galactic plane. This system is also unusual for having a main-sequence companion. It is the first of a new class of systems that is thought to have started their evolution as triple systems. Another unusual system is PSR J1950+2414, a MSP-WD system with a low-mass companion, an orbital period of 22 days and orbital eccentricity of 0.08. The origin of this system is still mysterious, but there are a few others that are very similar. Given the very high sensitivity of the Arecibo telescope, we can combine very high sensitivity with very short (5 minute) pointings. This allows us to retain sensitivity to extremely compact binary systems, which are likely to represent the best laboratories for the study of gravitational physics. Great examples of this are PSR J1946+2052, the most compact pulsar - neutron star system known (the orbital period is only 1h 53m), PSR J1913+1102, discovered in PALFA data by the Einstein@Home pipeline and likely to be asymmetric, and PSR J1906+0746 - which is by far the youngest pulsar known to be in a binary system. The companion to this pulsar is likely to be a recycled pulsar, but it could also be a heavy white dwarf. Apart from pulsars, one of the types of objects targeted by the PALFA survey is fast radio bursts (FRBs). The first FRB to be discovered with a telescope other than the Parkes radio telescope was found in the PALFA survey. However, the unparallelled sensitivity of the Arecibo telescope has allowed us to see what no other telescope had been able to see before: some FRBs repeat! 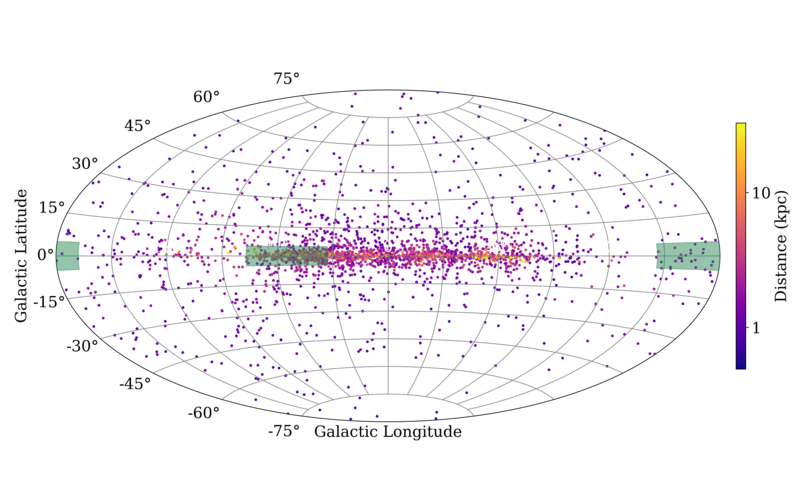 Figure 2: Galactic location of the new P-ALFA pulsar survey discoveries. The center of the Galaxy is indicated by the center of the coordinates, the position of the Solar System is indicated by the red dot on the left. The PALFA search areas are indicated in light blue. The dots indicate pulsars, this time colored according to their DM. The new PALFA discoveries are indicated by the larger dots. The PALFA millisecond pulsars have, on average, considerably larger distances than the previously known millisecond pulsar population in the same section of the Galaxy. Figure 3: Positions of the pulsars as a function of Galactic longitude and DM. The black curve indicates the maximum Galactic column density according to the Cordes and Lazio (2001) model of the electron distribution of the Galaxy. Orange dots indicate positions of known pulsars that appear in the ATNF pulsar catalog (Manchester, R. N., Hobbs, G.B., Teoh, A. 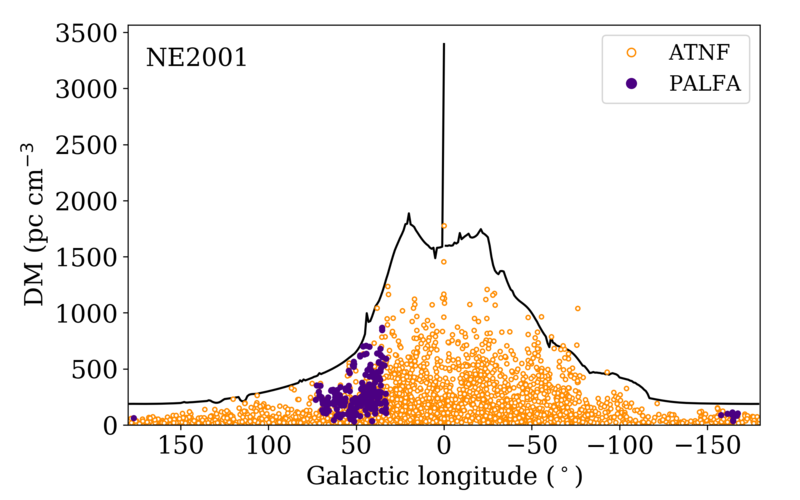 & Hobbs, M., AJ, 129, 1993-2006, 2005) with Galactic latitude smaller than 5 degrees, and purple indicates new discoveries by the Arecibo P-ALFA survey. There seems to be a deficiency in the number of pulsars at Galactic latitudes of 60 degrees. With ALFA, we need about 47 pointings to cover one square degree, compared to about 330 pointings needed to cover one square degree with similar density with a single-pixel feed. Until 2009, we were using the Wideband Arecibo Pulsar Processors (WAPPs) to detect the signal from ALFA's seven beams. These cover 100 MHz of band (with dual polarization capability), initially centered at 1420 MHz and later at 1440 MHz. In 2009, the survey transitioned to new and improved back-ends, the Mock polyphase filterbank spectrometers, which are capable of covering 300 MHz (from 1225 MHz to 1525 MHz, the bandwidth covered by ALFA) for each of the seven beams (see detailed technical specifications here). This has resulted in greatly increased search sensitivity, but only for pointing where we can effectively deal with all the radio frequency interference. 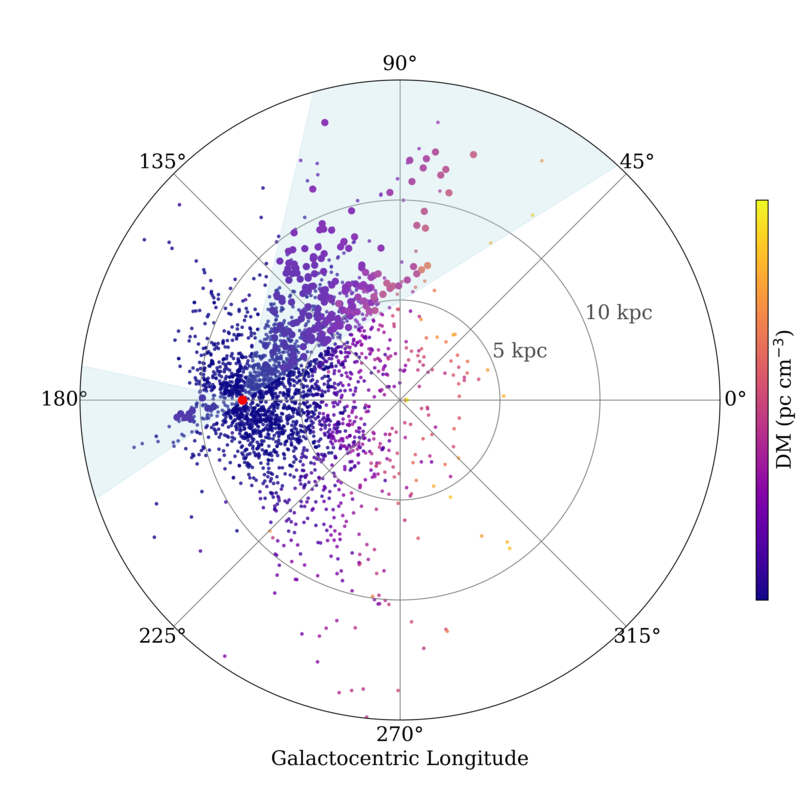 From August 1 to October 8 2004, we conducted a preliminary survey that covered the two regions closest to the Galactic plane (|b| < 1 degrees) visible from Arecibo: the "Inner Galaxy" (40 < l < 75 degrees) and the "Anti-center" (170 < l < 210 degrees). Each pointing was 134 seconds for the Inner Galaxy and 67 seconds for the Anti-center. This was done in sparse mode, where we do only 1/3 of the pointings needed to cover the whole region. This preliminary survey found a total of 11 new pulsars, and detected 30 previously known pulsars. For a detailed description of this survey, and the strategy of the present survey, see Cordes et al. (2006). The survey will cover the Galactic plane (|b| < 5 degrees) visible with the Arecibo 305-m radio telescope (35 < l < 75 degrees, see Fig. 1). Each pointing lasts about 268 seconds in the Inner Galaxy and 134 seconds in the Anti-center. The first pipeline is the ``Quicklook'', where pulsars are found almost in real time. This is made possible by reducing the spectral and time resolution by a factor of 16, and using a computer cluster, the Arecibo Signal Processor to search for pulsars in the data. This is a nice and quick way of detecting slow pulsars, but the sensitivity to fast pulsars is severely degraded. This was the pipeline that discovered the compact, highly relativistic pulsar - neutron star system J1946+2052 and many other pulsars. After this, the full-resolution data are processed by the pipelines below. The PRESTO pipeline is based on PRESTO, a large suite of pulsar search and analysis software. It employs a Fourier-Domain acceleration search technique, which compensates for the loss of detection sensitivity in a traditional periodicity search due to a rapidly changing frequency of the periodic pulsar signal. Such frequency modulation can occur, for instance, due to a pulsar's orbital motion in a compact binary. The PRESTO pipeline also includes a single-pulse search pipeline and a newly introduced Fast Folding Algorithm. The PRESTO pipeline is run on the Guillimin supercomputer operated by McGill University in Montreal, Canada, producing several million signal candidates so far. The third pipeline is based on distributed computing. Since March 2009, part of the Einstein@Home computing power is used to analyze PALFA data. The Einstein@Home algorithm is particularly sensitive to radio pulsars in tight binary systems, with a phase-space coverage that is complementary to that of the PRESTO pipeline. To date (August 2016), it has discovered 30 previously unknown pulsars. This was the pipeline that discovered the pulsar - neutron star system PSR J1913+1102. The data processed thus far has revealed that the radio frequency interference (RFI) environment at Arecibo significantly affects the detection threshold of the survey, creating unforseen challenges in identifying the many weak pulsars that are likely lurking in the data. To address this, the PALFA consortium is actively developing novel techniques for identification, mitigation, and excision of RFI. We are also implementing a variety of heuristics as well as machine learning algorithms for identifying real pulsars among the millions of signal candidates, most of which appear to be due to RFI. The inevitable growth in the incidence and variety of man-made RFI suggests that this problem will likely be important for all future radio pulsar surveys. The Arecibo Remote Command Center (ARCC) at the University of Texas at Brownsville and the University of Wisconsin at Miwaukee is currently engaged in searching for radio pulsars in ALFA data. ARCC is an integrated research/education facility that allows students at the high school and undergraduate level to be directly involved with the research at the Arecibo telescope. Web based tools have been developed so that students could rank the pulsar candidates created by the PRESTO analysis. The most compact pulsar - neutron star system ever!! A pulsar - neutron star discovered by Einstein@Home! A Repeating Fast Radio Burst! The disappearance of the cosmic spinning top! Arecibo confirms Fast Radio Bursts from outer space! First Pulsar Discovery by Global Volunteer Computing! ALFA Finds its first MSP! This is the first eccentric binary millisecond pulsar in the galactic plane! PSR J1928+1746: First pulsar discovered with ALFA! PALFA Single-Pulse Pipeline: New Pulsars, Rotating Radio Transients and a Candidate Fast Radio Burst (Patel et al., 2018, ApJ, 869, 181). The implementation of a Fast-Folding pipeline for long-period pulsar searching in the PALFA survey (Parent et al., 2018, ApJ, 861, 44). PALFA Discovery of a Highly Relativistic Double Neutron Star Binary (Stovall et al., 2018, ApJ Lett, 854, 22). Timing of 29 Pulsars Discovered in the PALFA survey (Lyne et al., 2017, ApJ, 834, 137). Two long-term intermittent pulsars discovered in the PALFA survey (Lyne et al., 2017, ApJ, 834, 72). Timing of Five PALFA-Discovered Millisecond Pulsars (Stovall et al. 2016, ApJ, 833, 192). The repeating Fast Radio Burst FRB 121102: Multi-wavelength observations and additional bursts (Scholz et al., 2016, ApJ, 833, 177). Einstein@Home discovery of a Double-Neutron Star Binary in the PALFA survey (Lazarus et al. 2016, ApJ, 831, 150). A repeating fast radio burst (Spitler et al., 2016, Nature, 531, 202). Arecibo Pulsar Survey Using ALFA. IV. Mock Spectrometer Data Analysis, Survey Sensitivity, and the Discovery of 40 Pulsars (Lazarus et al., 2015, ApJ, 812, 81). Einstein@Home Discovery of a PALFA Millisecond Pulsar in an Eccentric Binary Orbit (Knispel et al. 2015, ApJ, 806, 140). Timing of five millisecond pulsars discovered in the PALFA survey (Scholz et al. 2015, ApJ, 800, 123). The Binary Companion of Young, Relativistic Pulsar J1906+0746 (van Leeuwen et al. 2015, ApJ, 798, 115). Fast Radio Burst Discovered in the Arecibo Pulsar ALFA Survey (Spitler et al. 2014, ApJ, 790, 101). Arecibo Pulsar Survey Using ALFA. III. Precursor Survey and Population Synthesis (Swiggum et al. 2014, ApJ, 787, 137). Searching for pulsars using image pattern recognition (Zhu et al. 2014, ApJ, 781, 117). Timing of a Young Mildly Recycled Pulsar with a Massive White Dwarf Companion (P. Lazarus et al. 2014, MNRAS, 437, 1485). The Einstein@home Search for Radio Pulsars and PSR J2007+2022 Discovery (B. Allen et al. 2013, ApJ, 773, 91). Properties of Thirty-Five Pulsars Discovered in the PALFA Survey (D. Nice et al. 2013, ApJ, 772, 50). PEACE: Pulsar Evaluation Algorithm for Candidate Extraction - A software package for post-analysis processing of pulsar survey candidates (Lee et al. 2013, MNRAS, 433, 688). Four Highly Dispersed Millisecond Pulsars Discovered in the Arecibo PALFA Galactic Plane Survey (F. Crawford et al. 2012, ApJ, 757, 90). Two Millisecond Pulsars Discovered by the PALFA Survey and a Shapiro Delay Measurement (J. Deneva et al. 2012, ApJ, 757, 89). Arecibo PALFA Survey and Einstein@Home: Binary Pulsar Discovery by Volunteer Computing (B. Knispel et al. 2011, ApJ, 732, 1). On the Nature and Evolution of the Unique Binary Pulsar J1903+0327 (P. Freire et al. 2011, MNRAS, 412, 2763). Pulsar Discovery by Global Volunteer Computing (B. Knispel et al. 2010, Science, 329, 1305). Arecibo Pulsar Survey Using ALFA: Probing Radio Pulsar Intermittency And Transients (J. S. Deneva et al., 2009, ApJ, 703, 2259). PSR J1856+0245: Arecibo Discovery of a Young, Energetic Pulsar Coincident with the TeV Gamma-ray Source HESS J1857+026 (J. W. T. Hessels et al. 2008, ApJ, 703, 2259). An Eccentric Binary Millisecond Pulsar in the Galactic Plane (D. Champion et al. 2008, Science, 320, 1309). Arecibo and the ALFA Pulsar Survey (J. van Leeuwen et al., 2006, ChJAS, 6b, 311, see .pdf presentation here). Arecibo Pulsar Survey Using ALFA. I. Survey Strategy and First Discoveries (Cordes et al., 2006, ApJ, 637, 446). The PALFA Survey: Going to great depths to find radio pulsars (P. Lazarus and the ALFA Pulsar Consortium). Two Millisecond Pulsars Discovered by the PALFA Survey and a Shapiro Delay Measurement (J. Deneva and the ALFA Pulsar Consortium). Two Pulsar Discoveries from the Einstein@Home Distributed Computing Project (J. Deneva and the ALFA Pulsar Consortium). An Update on the Status of the Pulsar-ALFA Survey (P. Lazarus). Finding Pulsars with Einstein@Home (B. Knispel and the ALFA Pulsar Consortium). Arecibo Multibeam Pulsar Surveys: Overview and Discovery of a Young Relativistic Binary (F. Camilo and the ALFA Pulsar Consortium). ALFA pulsar surveys: Searching for fundamental laboratories of extreme physics (P. Freire and the ALFA Pulsar Consortium, see powerpoint presentation). ALFA Arecibo Pulsar Surveys (P. Freire and the ALFA Pulsar Consortium, see powerpoint presentation). The ALFA Pulsar Consortium is open to all researchers interested in observations of radio pulsars and related science, regardless of country or origin and level of expertise. The Consortium manages its collaboration on the CyberSKA portal. More information on ALFA and its performance.